From the moment you step on the shores of Redang till you leave, you will be mesmerize by its natural beauty. Whether it is long walks along the white powdery beach, or snorkelling around the reefs, you will be stunned by what Redang has to offer. Within a stone throw away from Redang Pelangi Resort lies the most beautiful stretch of Pasir Panjang's white powerdery sands which extends to the turqoise coloured sea with the nearest reefs being less than a few minutes away. 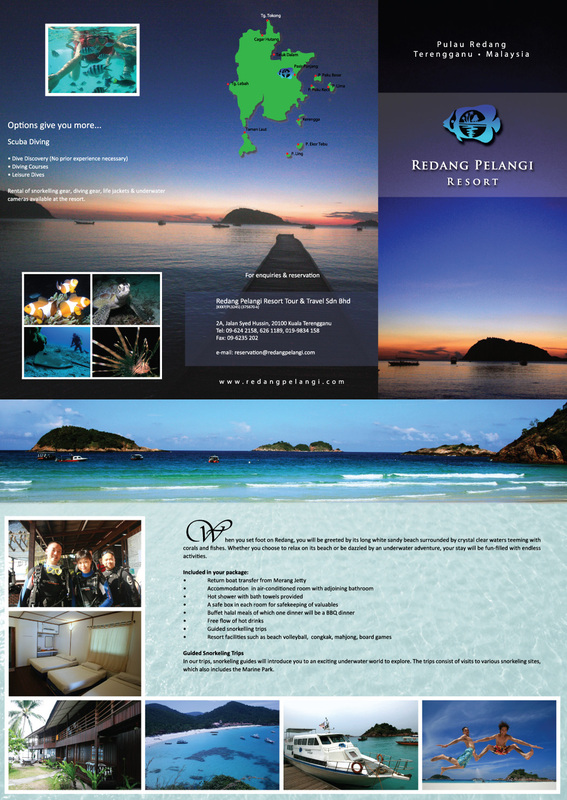 Redang Pelangi is the first resort to be serving Full Board Packages at Pulau Redang since 1990. Redang Pelangi prides itself for being a great value resort providing our satisfied customers with simple accomadation, buffet meals and fun snorkelling trips. With its timber based structures, Redang Pelangi compliments the surrounding environment without the need to intrude with more modern concrete structures. We strive to provide our customers with quick, friendly and excellent service. From the moment you make your reservation, to the moment you set foot on the island till you checkout and return to Kuala Terengganu, our staff will be there to assist you. You will feel right at home with our cosy environment and helpful staff. Pulau Redang (Redang Island) is situated 45km northeast of Kuala Terengganu or about 22km from Tanjung Merang. Gazetted as a Marine Park in 1994, it is a heaven for scuba divers and ideal for memorable holidays with crystal clear water, powdery white beaches and spectacular off shore snorkeling. Pulau Redang consist of a group of islands, with Pulau Redang being the biggest surrounded by a few smaller islands. 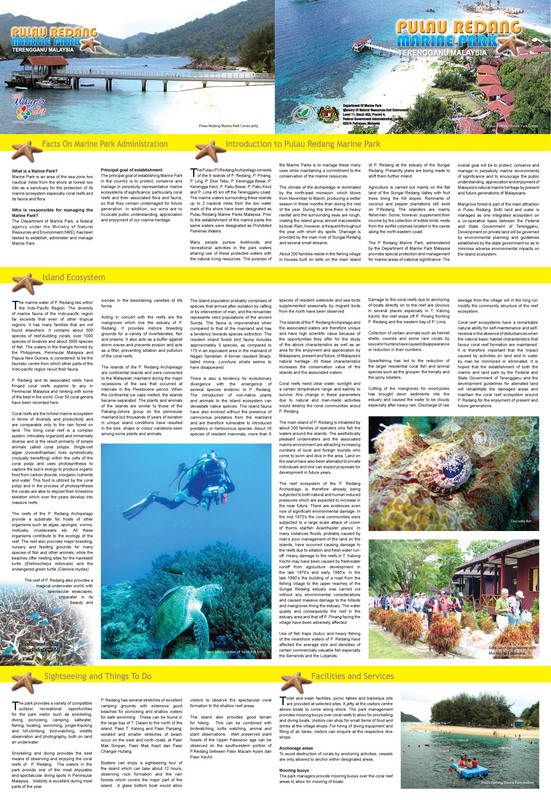 With the unique terrain, Pulau Redang as well as the surrounding islands have beautiful dive sites rich in both sea life and corals. To better serve our customers, we need to understand our customers needs and expecations. To improve ourselves, whether the resort or customer service, we would need your honest comments. We would like thank you for a taking the time to leave your comments. Changes may not happen over night, but all your feedback and comments will be taken into consideration. Ever dream of visiting 2 different islands off the coast of Terengganu when you visit Redang? 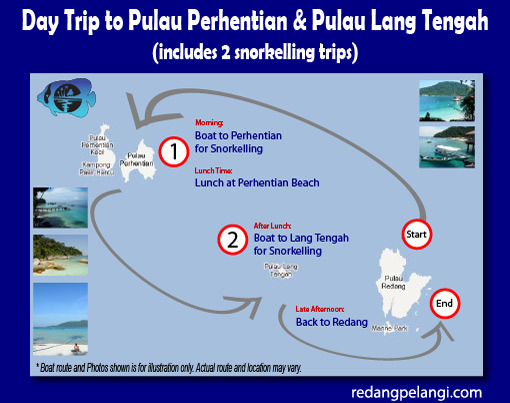 Now you can, as Redang Pelangi is offering a Day Snorkelling trip from Redang to Perhentian & Lang Tengah. This service is the first; any resort in Redang is offering. Redang Pelangi Resort Turns 20! 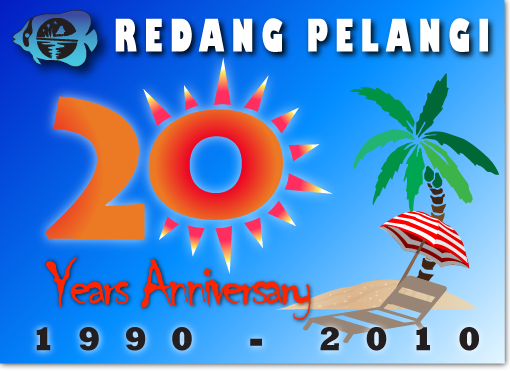 Wow, it has already been 20 years since Redang Pelangi Resort started to operate in Redang Island (Pulau Redang). What started as 4 chalets with 8 rooms has turned into 46 rooms today. Redang Pelangi Resort may not be a 5 Star Resort, but we do pride ourselves with providing a cosy and friendly stay with the basic necessity. We would like to thank all our guests for supporting us over the years. One of our notable returning guest have visited us 6 times with their longest being over a month! Redang Pelangi have been featured in newspaper articles, TV shows as well been selected as the preferred location for many event organiser. Click here to see media release. 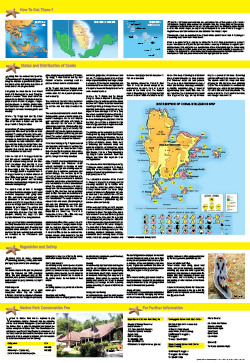 Detailed PDF file available click here! Or click on image above for full sized image. Detailed PDF file available click here! Or click on image above for full sized image. Detailed PDF file available click here! Or click on image above for full sized image. As visitors to Redang, what can we do to help preserve these diminishing coral reefs. . Let’s explore each and every cause to better understand why our actions are causing the death of these corals. The rising of water temperature can be caused by only one thing, GLOBAL WARMING. With the rise of temperature, corals expel their symbiotic food-producing algae, a process known as bleaching. These dying corals turn bleach white, and seldom recover. If you walk along the long beach at Redang, you would notice lots of these bleached white dead corals washed to shore. We can all do our little bids to help with global warming. To easiest way to help out is to use less electricity while you are in staying in the resorts in Redang. Yes, it feels great to enter your 20 degree chilled air conditioned room after a hot day out, but it is just wasteful to keep the room cooled when you are not even in there. It takes only 10-15 minutes to cool your room down, not by keeping your air condition switched on 24 hours. The luxury of having your air condition rooms and hot water supply is at the cost of running diesel generators. Yes, almost all the power in Redang is generated by diesel running generators. Do your bid, and save energy during your stay at Redang, with less consumption of energy it would help us to burn less diesel. 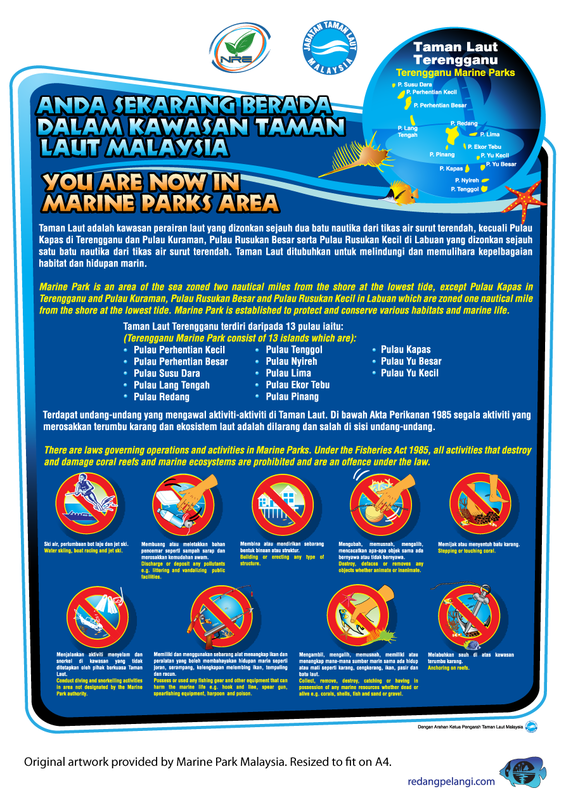 When was the last time you visited the Marine Park at Redang Island. Did you notice most of the corals are dying, compared to your visit there 20 years ago? Most of these diminishing and dying corals are caused by human interactions. So many times while I was snorkeling, I see irresponsible patrons trampling on these living corals flats. What they assume is a rock, is actually a coral reef. Yes, all those macho boys need to prove something by trying to out do each other. They would swim close to the corals to touch it, or even break some off, just to show to their peers that they had collected a souvenir from their trip to Redang. Some even use plastic bags to capture the fishes, causing tremendous stress to them. Fins for snorkels was banned a few years back as the marine park realized that most of these snorkelers had trouble controlling their fins and causing coral damage when they accidently kicked it. Stop touching these corals as touching the corals will remove the smooth mucous membrane from the coral surface. This will indirectly remove their protective layer, allowing these corals to scar and be more prone to infections or predators. The lesson to learn here is simple. We are here to “Observe”, take nothing, touch nothing. The use of NON coral safe sunblock have been causing these corals to die. Studies have found that the chemical found in most sunblock activates a viruses that kill these symbiotic algae that feeds coral through photosynthesis. Without the algae, the coral turns bleach white and dies. Use sunscreens with physical filters, which reflect instead of absorb ultraviolet radiation. Also use eco-friendly chemical sunscreens. So the next time you purchase your sunblock, make you you purchase Coral Safe sunblock. 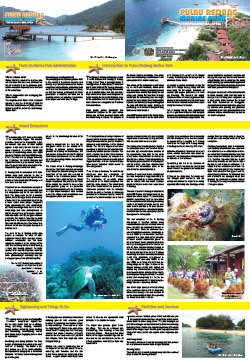 Since 1991 Redang Island and its neighboring islands became a protected Marine Park of Malaysia. As a marine park, human activities and development have been limited to manage and to protect the marine environment and to conserve its coral reefs. Fishing is not allowed within the 3.2km radius. Collection of all marine life including shells and corals are also strictly prohibited. However, many fisheries still practice banned methods of fishing by using cyanide or dynamite to capture their fishes. These practices are wrong, and not only cause death to sea life, but also to these corals. Cyanide is used by fisherman around the world to stun fishes before catching them for use as live fishes, whether in aquarium or restaurants. Fisherman needs to be educated and change their method of fishing to reduce damages to both the ecosystem and reefs. Sustainable fishing methods needs to be introduce as a healthy reef and ecosystem can produce up to 35 tons of fish per square kilometer each year!